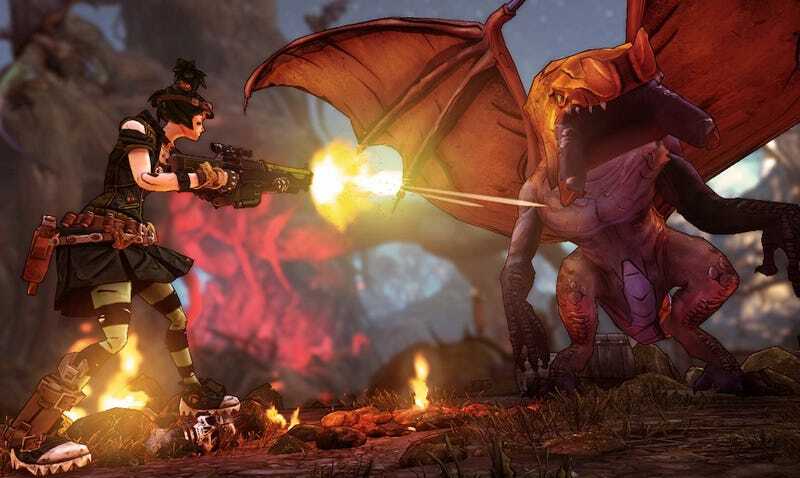 Gearbox, the creators of the Borderlands series, say the next campaign DLC—Tiny Tina’s Assault on Dragon Keep—is the biggest piece of content for their sequel yet. More areas to wander, more guns to fire and, more importantly, more enemies to shred to pieces. Warning: this list ends with the bosses of the main mission, so don't scroll all the way if you don't want to be spoiled. A basic Skeleton that attacks with one handed melee weapons. A Skeleton that uses a bow to make magic-based ranged attacks. They attack faster than a Skeleton Archer and will continue to attack the player after becoming headless. A Skeleton that is fully armored and dual wields scimitars. A heavily armored Skeleton wielding a mace and a tower shield that can block attacks. A Skeleton constructed of crystal that dual wields two crystal scimitars. Its crystal coating causes it to reflect bullets and projectiles, possibly bouncing them back at the player. A Skeleton engulfed in flames that carries a weapon made of fire. An oversized Skeleton that uses a large bone as a weapon. A Skeleton with a blue sword embedded inside it and cannot be killed until the sword is pulled out. A Skeleton that shoots magic bolts. A tiny Skeleton that attacks with a one handed melee weapon. A Skeleton that wields a one handed melee weapon and has a shield. A Skeleton that wears a striped shirt and runs up to players carrying two bundles of dynamite, exploding when they are close to the player. A Badass Skeleton that uses melee attacks. Treants spawn out of the ground and perform melee attacks on the player. When a Treant dies, it will release a swarm of Wisps that attacks and slows the player down. A tiny Treant, spawning out of the ground and uses melee attacks. When a Stumpy dies, it will release a swarm of Wisps that attacks and slow the player down. The Black Widow Spider can leap at the player and use melee attacks that deal corrosive damage that can also apply corrosive damage over time. A smaller Spider than the Black Widow Spider, the Spiderling can leap at the player and use melee attacks that deal corrosive damage and can also apply corrosive damage over time. A Badass Spider can use a melee attack where it spits poison at the player, causing corrosive damage. From farther distances, it can spit a web that slows the player down. A Grass Spider shoots webs at the player and will use a corrosive melee attack when the player is close. A Suicide Spider will leap to the player and explode. A half human, half Spider that wields a bow to fire arrows at the player. If the player gets too close, it will use a melee attack. A Spider with a top hat and human legs that uses melee attacks and spawns Black Widow Spiders. A Pixie is a creature that is initially neutral to the player, but if caught, can be turned into an ally that gives boosts to the player. If the player shoots at it, it will turn hostile and attack the player. An Orc that wields an axe and will leap at the player. An Orc that uses melee attacks and can throw his axe at the player. An armored Orc Warrior that can use a battle cry to level itself up as well as other Orcs around it. An Orc wearing a horned helmet that charges at the player. A suicidal Orc carrying a fire barrel that leaps at the player and explodes. A suicidal Orc carrying a shock barrel that leaps at the player and explodes. An Orc Bushwacker is a suicidal Orc carrying an explosive barrel that leaps and explodes at the player. An Orc that wears plated armor and dual wields guns. A basic Knight that attacks with a sword and is equipped with a tower shield. A well-armored Knight that attacks with a sword and is equipped with a tower shield that can block incoming damage. A large Knight that wields a claymore and a shield that can kick and leap at the player. A knight that has a round shield and wields a storm hammer that can deal electrical damage. A claymore wielding holy Knight. He can give himself a shield and heal allies as well as cast various spells to damage the player. A Knight that uses a bow to shoot arrows at the player from a distance. A Knight that uses a bow to shoot fire arrows at the player from a distance. They also have the ability to shoot multiple arrows to form a wall as well as a single arrow that explodes into multiple arrows mid-air. A Blue Dragon uses shock and fire attacks and can attack from the air or on the ground. Green Dragons use corrosive attacks and can attack on the ground or from the air. Purple Dragons use both slag and shock attacks and can attack from the air or on the ground. Red Dragons use fire attacks and can attack from the air and on the ground. A little Red Dragon that spits fire and uses melee attacks but cannot fly. Green Basilisks use melee and corrosive attacks but cannot fly. Dwarf Warriors leap at the player and attack with a one handed weapons that can also be thrown at the player. A Dwarf carrying a large mace that deals shock damage. A dwarf that wields a pickaxe and can throw sticks of dynamite at the player. A Dwarf that dual wields identical assault rifles. A Golem that uses melee attacks, but can fire lasers from its eyes and fireballs from its stomach and will become enraged if its core is destroyed. An armored Golem with a sword in its right hand and a large maul for a left hand that can launch at the player. A Wizard is able to fly, cast a magic missile, teleport to the player, and shield himself. A Sorcerer uses ice and electricity attacks. A Fire Mage uses fire spells and can summon a Phoenix. A Necromancer can spawn 3 Skeletons Warriors which will die when the player kills the Necromancer. An Orc that spawns as part of the “Critical Fail” side mission and uses melee attacks with its swords for hands. A unique Knight that spawns for the side mission “Loot Ninja.” His attacks are the same as a Knight. A unique knight that spawns for the side mission “Loot Ninja.” His attacks are the same as a Badass Knight. A unique Knight that spawns for the side mission “Winter is Bloody Business” and can throw an axe. The Skeleton King attacks with a large mace and if he takes lethal damage, his head will fly off and attack the player. His head can also resurrect his body, causing him to level up. An oversized Rock Golem that Greedtooth uses for mounting. While riding the Gold Golem, Greedtooth is protected by a shield and can throw dynamite at the player. A Spider boss found in the “Lair of Infinite Agony.” She wields a fire bow that can shoot multiple arrows in rapid succession or a single arrow that explodes on the player. The Sorcerer’s Daughter can also summon spiders and meteors as well as spit poison that will slow the player down and drain his/her life. The Handsome Sorcerer is the final boss and the ultimate Wizard. He has three phases based on the Sorcerer, Necromancer and Fire Mage. In his first phase, Handsome Sorcerer will summon three clones of himself. In his second phase, he will summon three Skeleton Warriors and in his final phase, he will summon three Red Dragon Babies. He also has the ability to summon a Red Dragon.